There’s a lot of controversy over whether or not high-altitude masks (sometimes called elevation masks, or breathing masks) improve your workout in the gym, but what’s often viewed as a training fad, could be the secret to beating your personal records, over and over. 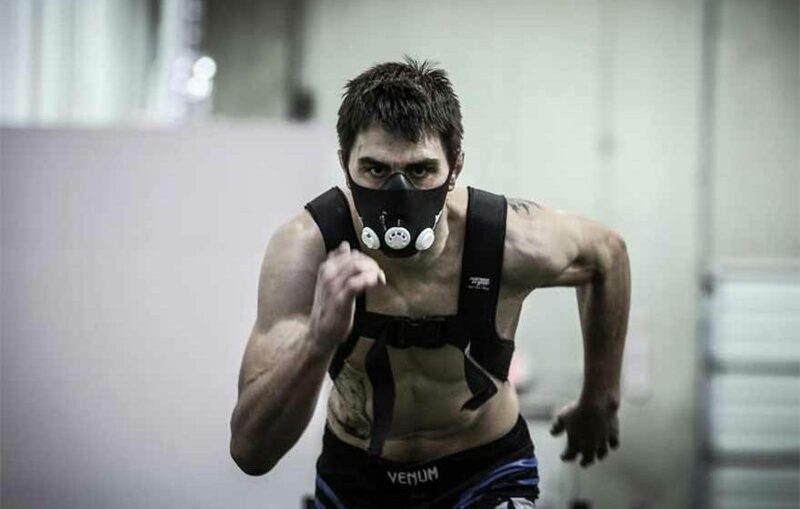 High-altitude masks, while their appearance alone might make you feel stronger and faster than before, often claim to simulate training at high altitudes. There’s a lot of research on how the body reacts to higher altitudes; specifically, how the lower atmospheric pressure reduces the amount of oxygen being sent to depleted muscles. Because the air is thinner at a higher altitude, the oxygen content is also lower. This means that if you’re used to running at lower elevations, or near sea-level, then your blood will not have the oxygen content needed to keep your muscles moving at high elevations, around 8,000ft above sea-level. The idea behind altitude training comes from the result of staying at high altitudes for longer than a couple of weeks. As your body adjusts to the decreased oxygen, it increases the main oxygen-binding proteins, Myoglobin and Hemoglobin, which allows the blood to carry more oxygen to muscles. This means that after training at high altitudes for at least a couple of weeks, the same level of performance would require less effort when you go back to near sea-level. Taking advantage of this, however, would mean training at high-altitudes and performing or racing at sea-level, which is hardly the case for most athletes. High-altitude masks get a bad wrap because of some of these claims, when high-altitude training may not give that much of an edge to begin with. The common misconception is that these masks simulate decreased levels of oxygen. Instead, they strengthen your respiratory muscles by giving them resistance, which in turn, increases your ability to send oxygen to the muscles that need it. High-altitude masks work by restricting air flow as you inhale and exhale. This sounds like it goes against every grain of common sense. How could restricting your breathing be considered positive, much less be a training tool? The advantage here is that the high-altitude mask makes your breathing muscles work harder. When these muscles are strengthened, your breathing becomes more efficient, allowing your body to work harder and improve performance. Now, you may be thinking, do I just go for a run with one of these masks on and afterward, I can suddenly breathe better? Well, no, not quite. It takes frequent and regular respiratory muscle training with a high-altitude mask for a few weeks before seeing significant results. This doesn’t mean you need to use the mask every time you train, but adding it to even a small part of your routine can give you noticeable gains after a few weeks. The benefits of training with a high-altitude mask comes directly from giving your respiratory muscles the workout they need. One study shows a group of cyclists who, after improving their respiratory muscle endurance by 12%, also improved by 4.7% in a time trial exercise designed to last roughly 40 minutes. Another study showed an improvement in swimmer’s performance in distances under 400m (differences in performance for longer distances were not recorded). There’s a lot of research out there to support the use of respiratory muscle training and its positive effect on athletic performance in a variety of sports. Using a high-altitude mask gives the respiratory muscles a workout by making you take deeper, more controlled breaths. When your breathing muscles improve, your overall performance improves. There’s still a lot of controversy around these masks. Many people claim that they’re ridiculous, and could never simulate high altitude training. To add to that, there’s the possibility that this type of training doesn’t offer much advantage to begin with. Skeptics are right when they say that wearing one of these masks won’t immediately increase red blood cell counts or your body’s ability to get oxygen to muscles on its own, but they’re not considering that a strong respiratory system can give those results. The altitude masks are what gives you that edge. If you’re training for short distance sprints, altitude masks could be the extra layer that your workout needs. After six weeks of respiratory muscle training, the total recovery time during a repetitive sprint test decreased 6.2% (give or take about 1%). This could not only make your sprint training more effective by increasing how much effort you can put in, but it can also improve your endurance for longer distances. The stronger your breathing muscles are, the longer it will take for your legs to fatigue when you’re running long distance races. This is because your able to send oxygen to your muscles more easily with a stronger respiratory system. Let’s take a look at 6 of the best altitude masks on the market. Since the masks fit over your mouth and nose, comfort is a really important factor. We’re going to look at the sizing and materials of each of these masks, as well as what kind of training conditions they’re best used in. If you’re wanting to give these masks a try but you’re still a little bit skeptical, here are two options at a really affordable price. These two masks, the first made by Coxeer and the second by West Biking, both check out under $20. The Coxeer mask is made with Nylon, while the mask from West Biking is made with Neoprene. Both fabrics are comfortable, but Coxeer’s mask offers a much more comfortable fit around the chin. Both of these masks would be a good, inexpensive option if you’re just wanting to try them out, but if you want something a little more serious, let’s keep going. Just a step above these two budget-friendly masks, is one made by Ankioo. Available for around $30, it has 6 different levels of resistance, making it much more versatile in your training. The shape and comfort isn’t much better than the previous masks though, and it uses a very simple head strap that’s joined by Velcro in the back. If you’re a runner, you may have a hard time keeping this one on your head. In the $50-$90 range, we open up our options a little more, and we see a really big difference in the way these masks fit. The Dimok Hypoxic Mask has a silicone mask that fits snugly over your nose and mouth, and the head strap fits very comfortably without slipping. You can also change the resistance on this mask without having to take it off. It’s made with a mesh nylon making it breathable and good for use in hot conditions. It’s also available in 3 different sizes. At $50, this mask is a really great deal. For more serious athletes, you might consider the Training Mask 2.0. This mask has 3 different nose pieces to offer different levels of resistance. Made with Neoprene, it boasts a lighter and more comfortable mask. With minimal face coverage, it doesn’t get too hot, or slip. Training Mask makes another one that offers only one level of resistance. It claims to require 9 times the effort to breathe, meaning, this one’s not for the weak. It covers more of the face to ensure that the mask stays put while playing more agile sports, that require more abrupt movements. When you’re ready to take your training up a notch, be sure to also grab this Spray Cleaner made by Training Mask. After a hard session, the Spray Cleaner makes it quick and easy to clean your mask, so it stays ready to go. This is a must-have, no matter which mask you decide on.